The National Institutes of Health Brochure on TMJ Disorders states that stabilization splints are the most widely used treatments for TMJ disorders, however studies of their effectiveness in providing pain relief has been inconclusive. Stabilization splints are also often recommended to prevent bruxism. Charles S. Greene, D.D.S., Clinical Professor, Department of Orthodontics, UIC College of Dentistry, Chicago, IL wrote the article below for our August 2013 issue of TMJ News Bites. Recently another article was published relating to this topic. We are re-posting Dr. Greene's article along with the new information. This article deals with the question of whether the stabilization splint, which is commonly used for treating TMDs and bruxism, may pose a risk of worsening obstructive sleep apnea in patients with that condition. While a few earlier studies have touched on this matter, this is the first study to use quantitative measures to answer the question. All subjects had 3 recordings done in a sleep laboratory while wearing a splint and 3 recordings without it. Also, it is the first one to use a randomized format in which each patient is his own control; half of the patients wore a splint first and then slept without it, while the other half followed the opposite protocol. The result was that there was a change in just one of the two variables studied. The variable affected, called AHI, which stands for Apnea-Hypopnea Index is a measure of obstructed airflow during sleep. If the index is higher than 5 events per hour and is accompanied by excessive daytime sleepiness, it qualifies for a diagnosis of obstructive sleep apnea. The second measure is called the Epworth Sleepiness Scale, which is a more subjective assessment of sleep disturbance. In this study, the Epworth Sleepiness Scale was not different between the two conditions of wearing or not wearing a stabilization splint, but there was some difference in the AHI scores. While this difference was relatively small, it was in the negative direction of worse scores while wearing a splint. The researchers commented that this may not be clinically significant in the short run, and there is no long-term data. However, they caution dentists who want to make a stabilization splint for their patients to at least inquire about whether obstructive sleep apnea is a condition they may have. Ramesh Balasubramaniam, BDSc, MS; Gary D. Klasser, DMD; Peter A. Cistulli, MD, PhD; Gilles J. Lavigne, DDS, PhD. Journal of Dental Sleep Medicine Vol.1, No.1, 2014. "...It appears that when patients with sleep bruxism and/or painful TMD complain about insomnia, snoring, and/or cessation of breathing during sleep, sleepiness of unidentified causes, or uncontrolled blood pressure, it is prudent to screen for the presence of sleep disordered breathing [SDB]. Such is done in collaboration with sleep medicine specialists using either sleep laboratory or home recording system with electromyography analysis of masseter/temporal muscle activity..."
"Dentists need to be aware that current standard maxillary oral appliances (occlusal splints) to protect teeth from attrition may not be appropriate treatment in the presence of sleep disordered breathing. That is, in some cases, occlusal splints [also known as stabilization appliances] may aggravate underlying sleep disordered breathing. Also, in some cases, mandibular advancement appliances may initiate or aggravate preexisting painful TMD in patients with sleep disordered breathing. Further prospective studies looking at the relationship between sleep bruxism and sleep disordered breathing, and painful TMD and sleep disordered breathing are warranted before it may be translated into clinical guidelines and standards of practice." This study raises the paradoxical problem that both types of splints may pose a problem for some patient subgroups. The bruxism patient who has SDB may have a negative effect from wearing a stabilization appliance, while patients who have both TMD and SDB may have a negative effect on their pain symptoms from wearing a mandibular advancement appliance. Dentists treating these patient populations need to carefully weigh all these factors when deciding what kind of appliances to use for each patient--or whether to recommend an appliance at all. Identify resources needed to enhance integration of existing data and optimize collection of data in the future to best advance research on overlapping pain conditions. Develop tools, models, and approaches to integrate ongoing and future data collection, analysis, and sharing. Address confidentiality issues relevant to accessing shared data. Develop approaches to expand clinical research on individual conditions to include multiple pain conditions. You can read the meeting summary and recommendations now available online. As such, if the TMD patients we represent have other pain conditions, it is our responsibility to advocate for research on all aspects of what is considered to be TMD. "...Data were presented showing that people with peripheral pain, caused by tissue damage or inflammation, may respond better to opioids than other types of painkillers. This group includes people with cancer pain, rheumatoid arthritis, and severe pain due to injury. On the other hand, people with central pain syndromes, characterized by disturbances in the processing of pain by the brain and spinal cord, may respond better to antidepressants and anticonvulsants than to opioids. Such syndromes include fibromyalgia, irritable bowel syndrome, temporomandibular joint disorder, and tension headache. To add to the complexity, some workshop attendees cautioned against making sweeping statements about which types of patients are-and are not-most likely to benefit from prescription opioids. The panel's report, a summary of which was just published in the Annals of Internal Medicine, contains many other valuable insights. For example, I was deeply troubled by how little scientific evidence exists to support the safety and efficacy of long-term opioid use; most clinical studies on opioids and chronic pain have lasted 6 weeks or less. That is a serious knowledge gap, especially in light of the fact that up to 8 million Americans use opioids for long-term pain management-and the known side effects of short-term opioid use include nausea, mental clouding, and respiratory depression, along with overdose. Until more scientific evidence is generated on the effects of long-term opioid use, the panel suggests that people seeking help for chronic pain be initially encouraged to try non-drug approaches, such as physical or behavioral therapy. If such approaches fail to ease the pain, potentially riskier drug options, including non-opioid and opioid medications, could then be explored-but with great care." Click here to read Dr. Collin's full blog post. For over 20 consecutive years, YOUR TMJA's advocacy efforts have resulted in Senate Labor, Health and Human Services, Education and Related Services Appropriations Subcommittee report language for TMD. Report language is vital as it tells agencies of the National Institutes of Health (NIH) that elected officials are concerned about specific issues. This directive has a powerful influence on the decisions made by the government agencies, including increased funding of scientific research. We're pleased to provide you with the 2015 Senate report language that was issued to the Office of the Director at the National Institutes of Health for TMD and Chronic Overlapping Pain Conditions. The Committee continues to support strongly an expanded and coordinated trans-NIH research effort on chronic overlapping pain conditions that solely or predominantly affect women. The Committee urges NIH to establish research standards for chronic overlapping pain conditions. This includes the development of a case definition, research diagnostic criteria, and a data repository. The Committee requests that NIH provide an update in the fiscal year 2016 CJ on the common data elements and outcome measures being developed. Further, the Committee commends the National Institute of Diabetes and Digestive and Kidney Diseases for its ongoing initiative, ''Multi-disciplinary Approach to the Study of Chronic Pelvic Pain [MAPP]'' Research Network, and encourages NIH to expand the network to include additional chronic overlapping pain conditions in the second phase of the initiative. Pharmacogenomics is the study of how variations in the human genome affect the response to medications. The TMJA is excited about this because it's the first opportunity for scientists to tailor medications specifically targeting the different molecular profiles of TMD patients. I could not close my mouth completely. I would hear a lot of popping in my ear as well and could not understand what was going on. I tried to associate the symptoms with allergies by taking different types of allergy medications, but they did not work. To make a long story short, I ended up seeing six doctors, an ENT specialist, a dentist and an orthodontist. They prescribed Naproxen, Robaxin, Tramadol, and a muscle relaxer. I was even fitted for a night guard. Two doctors told me I would just have to live with it. As a military spouse rather than a veteran, I was denied physical therapy. Since then, the jaw pain and most of the popping in my ear has gone away. I still live with a feeling of tightness in my jaw joint. It does get bad at night, but I just deal with it. I exercise, do jaw exercises, stretch daily, and avoid hard foods. Also, I'm working on a soft food/no sugar meal plan. A bad habit of cheek chewing and phone cradling may explain why the discomfort hasn't completely gone away. To help, I just purchased a gel beaded TMJ relief head wrap. Praying for a cure, I hope I don't have to live the rest of my life with this discomfort. I wish the same for others who are dealing with this disorder. Thanks for listening. In our November issue we told you about the Food and Drug Administration's (FDA) public comment request for diseases they should address in upcoming patient-focused meetings. We'd like to thank all of you that submitted a comment to the FDA. We are pleased that Congressman Charles Rangel of New York sent a letter to FDA requesting that TMD be included in the FDA's patient-focused meetings. Click here to read the Congressman letter. The FDA is still reviewing public comments and has not yet announced the list of diseases they will focus on in their upcoming meetings. We will certainly let you know if TMD is selected. We thank Mr. John Lucas of Caddy Wraps for sending us 10 hot and cold therapy face wraps over the holidays to distribute to patients that need them. Read our past blog article about this product. If you would like to receive one of these, we will send one to the first 10 people who contact us. 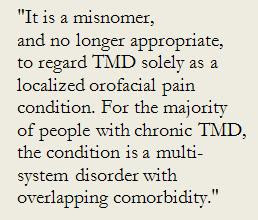 It is extremely rare that The TMJ Association hears from a patient who has only jaw dysfunction and no pain. Therefore, we are always interested in activities that bring attention to the many costs of pain and efforts to alleviate them. We appreciate the work of the Consumer Pain Advocacy Task Force (CPATF) and are responding to their recent request to bring the following to your attention. In March 2014, sixteen organizations formed CPATF to unite around one goal - to work collectively to promote, support and monitor the implementation of the National Pain Strategy (NPS). Learn more about the NPS and how you can be involved by clicking here. We will keep you informed along the way and ask for your involvement at critical moments. Stay tuned and be ready to take action. We expect the NPS Report to be released for an open public comment period soon and will send you an action alert at the right time so you can join thousands of others living with pain to speak out in response. Chronic pain is an unrecognized and under-resourced public health crisis with devastating personal and economic impact. Effective pain care requires access to a wide range of treatment option. Allowing people to suffer with unmanaged pain is immoral and unethical. In the meantime, please read and share this information sheet with others-your family, friends, healthcare providers and community. The National Institutes of Health's Office of Research on Women's Health has developed a tool to promote healthy lifestyles by offering practical guidelines and strategies women can use every day to reduce the risk of developing illnesses or conditions affecting quality of life. Below are the final topics. Click here to learn more about the NIH's Primer for Women's Health. The TMJ Association is the only patient advocacy organization fighting for the best science that will lead to greater understanding of Temporomandibular and related disorders and safe and effective treatments. We need YOUR help in these efforts. Please consider contributing to The TMJ Association; we offer a number of ways you can do this. If you a re already a member of the TMJA family you have our heartfelt thanks. We invite everyone to join us in changing the face of TMJ. If you purchase items from Amazon you can now help raise money for The TMJ Association with every purchase. Amazon will donate 0.5% of the price of your eligible AmazonSmile purchases to The TMJ Association. It's like regular Amazon but with the wonderful opportunity to help raise money for us. Yes, I want to help change the face of TMJ with my donation!